The valour and sacrifice of thousands of Queenslanders who died during World War I is being remembered with a 100km trek from Brisbane to Woodford. In keeping with the spirit of ANZAC, people from all walks of life have been invited to take part in the World War I Queenslander Challenge to commemorate the diggers. The treks are held four times a year coinciding with the centenary of WWI from 2014 to 2018, with the most recent trek held April 2 and 3. “A trek is an organised journey with a purpose,” Kedron-Wavell RSL sub-branch senior vice-president Phil Lilliebridge said. This trek would commemorate about 6000 Queenslanders who were killed during the war. Each participant is required to carry a brick engraved with the name of a fallen soldier to pay tribute, with each brick being used to build a feature wall. Mr Lilliebridge said he hoped the memorial would be erected at Woodford in 2018, when the final trek takes place. The location, design and size of the feature wall are still to be decided. “It behoves us as an ex-service organisation to remember and commemorate their sacrifice,” Mr Lilliebridge said. 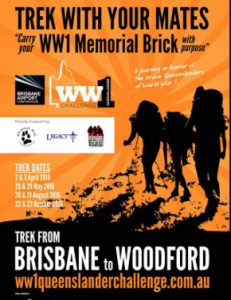 Participants at the most recent trek emphasised the importance of getting the bricks from Brisbane to Woodford. Woodford RSL sub-branch president Ron Nipperess said it was a very emotional time for families when the trekkers arrived in Woodford, the expected location for the commemorative wall. The event was also an opportunity to raise funds for charities involved with helping past and present diggers and their families, including Whiskey’s Wish, Legacy and Soldier On. Street poll: an Indigenous Day holiday? To get regular updates sent direct to your email just complete the form below. My name is and my email address is . Please send news digests to my email once a weeka fortnighta month .